An investment in a NAWBO membership provides a portfolio of benefits that propel business growth and fuel personal and professional development. NAWBO is proud to serve as the voice of the nation’s over 10 million women-owned businesses and represent women entrepreneurs in all sectors, sizes and stages of development and at the local level members are encouraged to engage actively with their local chapter to gain access to other women business owners, leadership development and community development. The diversity in our membership strengthens our voice across the country as all women entrepreneurs are encouraged to bring their expertise and insight to the table. Members of the National Association of Women Business Owners® (NAWBO®) are part of the largest dues paying organization for women entrepreneurs. A NAWBO® membership offers women-owned businesses the best of all worlds – connections to a national organization and brand as well as a local platform for their business and their voice and the ability to tap into the power of an already established organization. For membership information please contact Deborah Snyder at dsnyder@nawbo.org. Student Member APPLICATION, please complete the online form and submit proof of enrollment. Those members that have sold their business and would like to be a Retired member click here. Membership starts on the first day of any given month and includes a 60-day grace period. Membership dues are non-refundable. If you have already created a profile you need to login and then select the Become a Member link. If you need additional assistance please contact techsupport@nawbo.org. In addition to the National, California and general Chapter member benefits below, each chapter compliments their offerings to create added benefits to their members. Find what your local chapter can do for your business today! Here are a few of the benefits that a NAWBO membership offers. NATIONAL & LOCAL MEMBERSHIP: A NAWBO membership offers women-owned businesses a national and local platform to tap into the power of an already established community of women entrepreneurs. 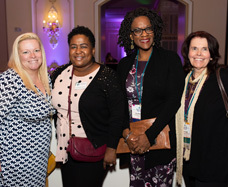 At the national level, NAWBO touts a membership of more than 5,000 members and 60 chapters across the country; and at the local level, members are encouraged to engage actively with their local chapter to gain access to other women business owners, leadership development opportunities and community involvement. PARTNERSHIPS & ALLIANCES: NAWBO is an unparalleled resource for women entrepreneurs seeking to navigate the various stages of business growth. NAWBO attracts corporations and affiliate partners that offer a rich base of resources and expertise that can help propel women business owners to the next level of success. MEMBER-ONLY BENEFITS: NAWBO members enjoy exclusive access to benefits and products that are designed to help manage their business on a day-to-day basis. Our wide network of partners and sponsors offer affinity discounts and benefits that deliver bottom line savings to our members while building a valuable network of resources that are critical to business success. WEBSITE: NAWBO members have access to a dynamic online platform that offers a multitude of tools and resources critical for navigating the everyday challenges of business ownership. Members are assigned a unique username and password upon joining— providing a powerful platform for building a national network, connecting them with peers and tapping into valuable resources to help grow their business. COMMUNICATIONS: NAWBO offers a variety of online communication vehicles that provide our members with pertinent information that will help make the most of their membership experience. Members receive press releases and announcements to keep them abreast of our activities at the national level; and our calendar of events help our members and chapter leaders actively participate at local and national events. ONLINE MEMBER DIRECTORY: The online member directory enables members to update and manage their own profile and connects the entire membership base for business development and networking opportunities. ADVOCACY & LEGISLATIVE ACTION CENTER: NAWBO represents a significant and united voice on issues that impact businesses daily. ANNUAL AWARDS: Through our Annual Awards Program, NAWBO gives recognition to the rising power of women business owners by commemorating the history of women’s entrepreneurial excellence and honoring the accomplishments and contributions of those who have led the way. LEADERSHIP DEVELOPMENT: NAWBO provides an opportunity for members to hone their leadership skills at the local and national level. 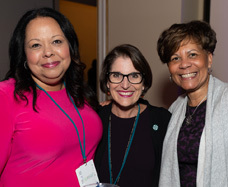 Our extensive network of volunteer leaders are critical to the success of NAWBO and contribute significantly to building a legacy for the next generation of women entrepreneurs. NATIONAL CONFERENCE: NAWBO’s Women’s Business Conference is the only event of its kind that provides women business owners with personal and professional business development opportunities to take their businesses to the next level of success. 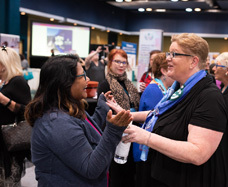 The annual conference brings together businesses of all sizes from all industries to celebrate and leverage the collective power of the fastest growing segment of the economy—women business owners. NAWBO BRAND: NAWBO members are an extension of our national brand. Through entrepreneurial success and community involvement, our members help elevate NAWBO's brand by proudly showcasing their association with an organization that propels women business owners into economic, social and political spheres of power. Are you the right fit for our growing organization of women entrepreneurs? Business Size: Businesses owned by NAWBO® members are larger than the average women-owned businesses in terms of number of employees. Sixty-eight percent have employees; of which 17 percent have 10 or more employees. Revenue: Twenty-five percent of NAWBO® members make more than $1 million in annual sales; and 34 percent make more than $500K. Years in Business: NAWBO® members have owned their business for an average of 10 years. Age: Seventy five percent of NAWBO® members are over the age of 45; and 25 percent are in the 35-44 age group. Access to Capital: As with the general women-owned firms, many NAWBO® members access capital through credit cards and personal family savings. Fifty-eight percent use credit cards and 37 percent utilize private and family savings to fund their business. Industry: Thirty-five percent, the highest number, of NAWBO® members belong in the Professional, scientific and technical services sector. Education: Generally, NAWBO® members are very well educated with 39 percent with post-graduate degrees. NAWBO is proud to serve as the voice of the nation’s over 10 million women-owned businesses and represent women entrepreneurs in all sectors, sizes and stages of development and at the local level members are encouraged to engage actively with their local chapter to gain access to other women business owners, leadership development and community development. The diversity in our membership strengthens our voice across the country as all women entrepreneurs are encouraged to bring their expertise and insight to the table. Members of the National Association of Women Business Owners® (NAWBO®) are part of the largest dues paying organization for women entrepreneurs. A NAWBO® membership offers women-owned businesses the best of all worlds – connections to a national organization and brand as well as a local platform for their business and their voice and the ability to tap into the power of an already established organization. Spring Membership Drive Application valid March 1, 2019 - April 30, 2019. If you have already created a profile you need to login and then select the Become a Member link. If you need additional assistance please contact techsupport@nawbo.org. Member receives all communications and publications, is eligible for all discounts and benefits, and is listed in the online member directory. Chapter membership is automatic for those whose businesses are located in a chapter area. To qualify for membership, members must own a percentage of their company. Those outside the 45 mile radius of a chapter qualify for a NAWBO - Virtual membership. Voting Member: Voting empowers our members to directly impact the current and future movement of the organization with policies and processes. FCA US LLC (formerly Chrysler Group) is offering NAWBO members, family members in the same home and employees a $500 cash allowance on the purchase or lease of most Chrysler, Dodge, FIAT®, Jeep® and Ram® models. Member receives all communications and publications, is eligible for limited discounts and benefits, and is listed in the online member directory. Chapter membership is automatic for those whose businesses are located in a chapter area. Those outside the 45 mile radius of a chapter qualify for NAWBO - Virtual. An Individual or Non-Profit Organization who subscribes to the objectives of NAWBO and wishes to lend support to NAWBO through membership. This category of membership includes limited discounts and is listed in the online member directory. The individual does not need to be a women business owner. A regular voting category, member receives all communications and publications, is eligible for all discounts and benefits, and is listed in the online member directory. Chapter membership is automatic for those whose businesses are located in a chapter area those outside the 45 mile radius of a chapter qualify for Virtual membership. To qualify for membership you must be a member in good standing for the last 5 years. Must be enrolled in an entrepreneurial program and submit proof of enrollment by fax to 202-403-3788 or upload as a document to your customer record. NAWBO membership is open to sole proprietors, partners and corporate owners with day-to-day management responsibility. Membership is recorded in the name of the individual, not the organization. Membership dues are nonrefundable. Dues are not deductible as a charitable contribution for Federal Income Tax purposes. In compliance with Omnibus Budget Reconciliation Act of 1993, it is estimated that 6% of the membership dues is non-deductible as a business expense.